Swiftcurrent Lake is a romantic view at sunset, which can be seen only within Glacier National Park. Swiftcurrent was formed in the so-called Many Glacier region in the U.S. state of Montana. Swiftcurrent is surrounded by the wild rocky hills of Mount Grinnell and Mount Wilbur. The crystal clear waters of Lake lure visitors to enter them, but the truth is that the water is much colder than it looks. On the east coast of Swiftcurrent is located the largest hotel complex in the Glacier National Park, which is named after the region's many glaciers. It provides everything you need for hiking around the lake. From here began many hiking trails throughout the park and around Swiftcurrent and even boats are available to visitors, which can take a romantic ride along the crystal waters. Swiftcurrent was formed at an altitude of 1486 meters above sea level in an area, which is quite rich in these waters. Slightly to the east can be seen Lake Sherburne, and to the southwest, you will reach a lake with a charming name - Lake Josephine. The gorgeous and seemingly unfriendly mountains west of Swiftcurrent reach 914 m height. 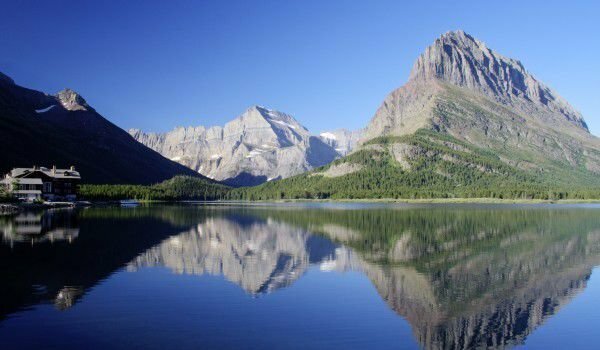 The main source of lake Swiftcurrent is the Grinnell Glacier, which disappears with alarmingly ever faster pace. Melting ice gives out early rivers, which in turn end in Swiftcurrent. The west Coast of the water basin is marked by Mount Gould. In many paths one can easily crawl along the lake and boats lead everyone to the site, which is the starting point for climbing the glacier. The most popular is the path that starts from the southern end of the hotel and leads along the Swiftcurrent, passing through cool wooded areas.